(CNN) This week, first lady Melania Trump will participate in a time-honored Washington tradition dating back more than 100 years — gifting her inaugural ballgown to the Smithsonian’s National Museum of American History. Trump will take part in the gown presentation ceremony. Lisa Kathleen Graddy, curator of the Smithsonian’s First Ladies Collection exhibition said the tradition began with Helen Taft in 1912. “Since then, it’s become the custom for the Smithsonian to make the donation request, and for the first lady to give her gown for the public to view,” Graddy said. The first lady leaves the President’s Room of the Senate after her husband was sworn into office on January 20. US President Donald Trump and his wife, Melania, arrive at Paris’ Orly Airport on Thursday, July 13. They were invited by French President Emmanuel Macron to attend the country’s Bastille Day celebrations. Melania Trump, seated fourth from left, plays with children during a visit to the Copernicus Science Centre in Warsaw, Poland, on Thursday, July 6. She was joined by Polish first lady Agata Kornhauser-Duda, who is in the pink jacket. The Trumps were visiting Poland ahead of a G20 summit in Germany. The Trumps arrive at the White House with their son, Barron, on Sunday, June 11. Melania and Barron were moving in. They had spent the last few months in New York so Barron could finish out his school year. Melania Trump arrives at the Vatican as she and her husband met Pope Francis on Wednesday, May 24. With Vatican protocol in mind, she wore a black veil and long-sleeved black dress draped down to her calf. The first lady visits a pediatric hospital in Vatican City on May 24. Trump visits the Western Wall, Judaism’s holiest prayer site, while in Jerusalem on Monday, May 22. A video clip went viral May 22 after the first lady appeared to swat her husband’s hand away after landing in Israel. It’s unclear what caused the swat, if anything. The Trumps held hands minutes later on the tarmac. They also held hands multiple times during their tour of the Middle East. The first lady high-fives a child during a visit to the American International School in Riyadh, Saudi Arabia, on Sunday, May 21. Melania Trump is joined by her husband as she speaks at a Mother’s Day event at the White House on Friday, May 12. The first lady takes part in a ribbon-cutting ceremony Friday, April 28, at the Children’s National Health System in Washington. She spoke at the opening of the Bunny Mellon Healing Garden, where patients and families can spend time outdoors while receiving treatment at the hospital. Trump listens while her husband speaks to the press in the White House Oval Office on Thursday, April 27. The first lady hugs a child at the annual White House Easter Egg Roll on Monday, April 17. They were making cards for members of the US military. The first lady’s Twitter account posted this photo Friday, March 2, of Trump reading a book to children at New York-Presbyterian Hospital. “Honoring children #worldbookday,” the tweet said. The first lady walks with Sara Netanyahu at the White House on Wednesday, February 15. Israeli Prime Minister Benjamin Netanyahu was in Washington to strengthen US-Israel relations after some strained years during the Obama administration. Lonnie Bunch, director of the National Museum of African American History and Culture, talks with Trump and Netanyahu as they tour the museum in Washington on February 15. The first lady shakes hands with Japanese Prime Minister Shinzo Abe before boarding Air Force One with her husband on Friday, February 10. The Trumps hosted the Abes at their Mar-a-Lago estate in Palm Beach, Florida. The Trumps arrive at Trump International Golf Club in West Palm Beach, Florida, on Sunday, February 5. The Trumps were attending a Super Bowl party at the club. The Trumps arrive for a Red Cross Gala at their Mar-a-Lago estate on Saturday, February 4. The first lady walks across the tarmac to greet well-wishers in West Palm Beach on Friday, February 3. Trump gives a speech during one of the inaugural balls in Washington on Friday, January 20. The first lady dances with her husband at an inaugural ball on January 20. Shortly after inauguration, the Smithsonian’s conservators begin to work with the White House to ensure the donation process is smooth; they even go so far as to craft a mannequin made to resemble the first lady’s physique as closely as possible. Trump’s ivory, silk crepe column gown, with a slit in the skirt and ruffle accent, will become a part of one of the museum’s most popular exhibitions — in 2016, more than four million visitors passed through the First Ladies Collection. The designer of Trump’s gown, Hervé Pierre, will also be in attendance on Friday. Pierre was formerly creative director for Carolina Herrera, the iconic American designer whose dresses were often worn by first ladies Michelle Obama and Laura Bush. Trump did not have a personal relationship with Pierre before asking him to design her inaugural gown. “When sitting down with Hervé to discuss her vision, the first lady knew she wanted a modern, light, unique and unexpected look,” Grisham told CNN. In an interview last month with The New York Times, Pierre said Trump first reached out to him on January 3, just 17 days before inauguration. “She gave me a couple of key words. She didn’t want a big ball gown, she wanted something sleek, ivory, vanilla. It had to be really, really right because it was going to be part of history — part of this country’s history but also part of what I will have achieved on earth. I’ve designed thousands of dresses, but people will remember this one most particularly,” he said. 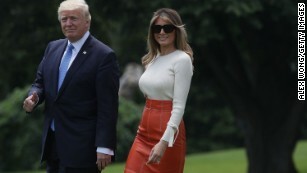 Trump has since worn custom-made Pierre designs a handful of times as first lady, most notably in May, departing from the South Lawn of the White House en route to Saudi Arabia, in an orange leather skirt and cream sweater. 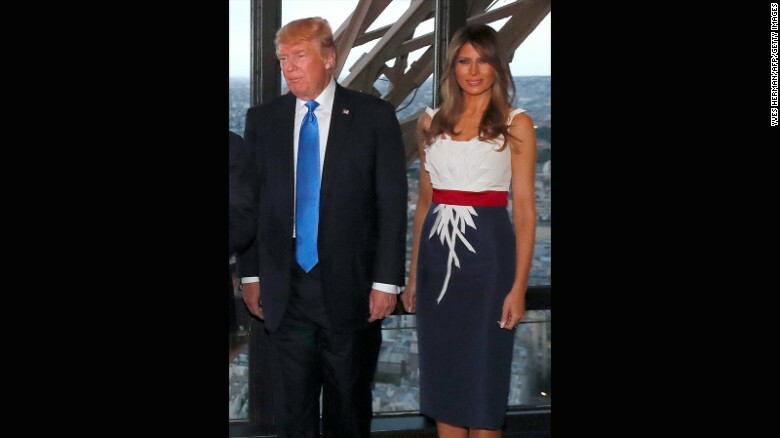 And in July, at a private Eiffel Tower dinner with President Donald Trump and French President Emmanuel Macron and his wife, Brigitte, in Paris, Pierre designed a red, white and blue dress with embellishments on the bodice meant to represent wheat. 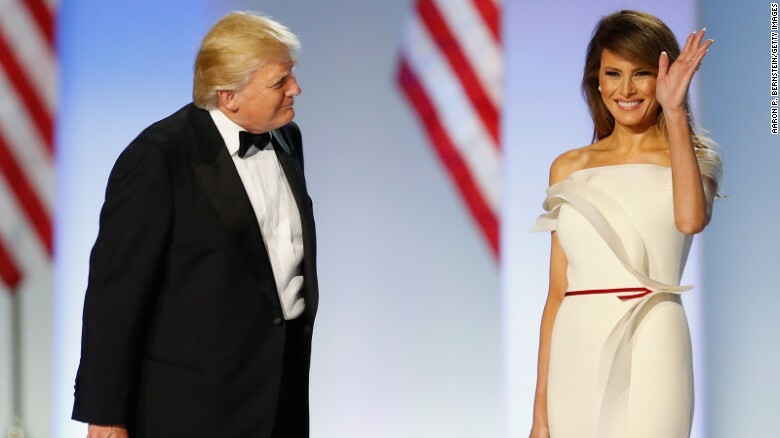 Trump’s gown had little of the glitz and drama of past first lady inaugural designs, though it was chic in its simplicity, with its off-the-shoulder neckline and a skinny, red belt as the only pop of color. 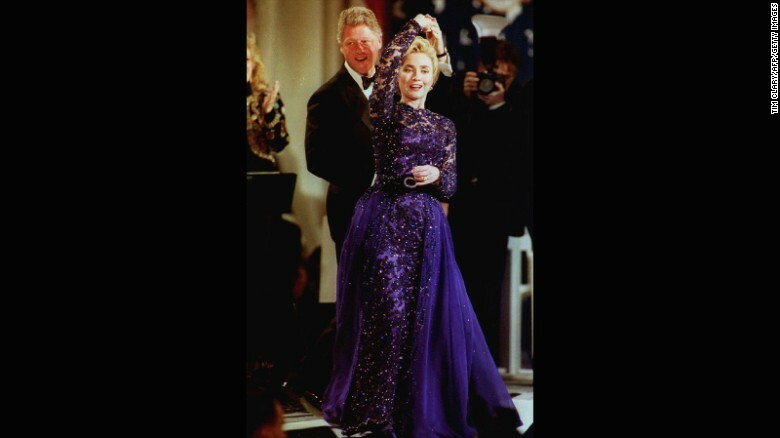 By contrast, Hillary Clinton’s 1993 inaugural gown was a purple lace and sequins number by Sarah Phillips, with long sleeves, a belt and a sheer overlay skirt. 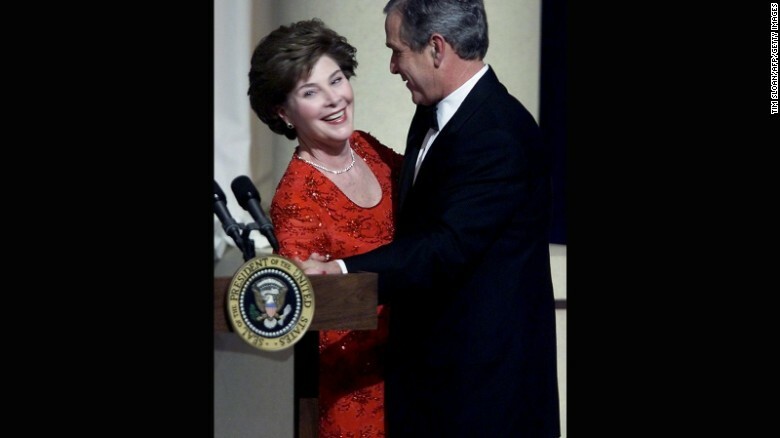 Laura Bush also went with sleeves and sparkle, wearing a ruby-colored gown by Texas designer Michael Faircloth. Trump’s predecessor, Michelle Obama, ushered in a new era of modern inaugural ball style, opting for designer Jason Wu for both of her husband’s inaugural celebrations. The first, in 2009, was a flowing, white, one-shoulder gown with floral appliqué, the second, a bold red gown made of chiffon and velvet. 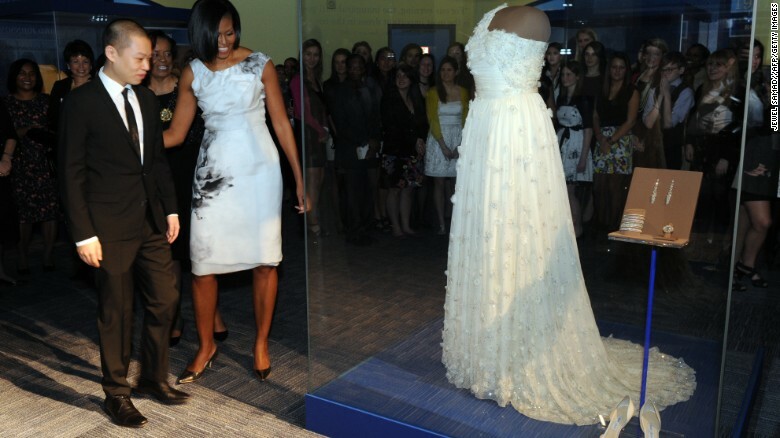 Obama and designer Jason Wu look at a display of her inaugural gown at the Smithsonian’s National Museum of American History. The white Wu is part of the Smithsonian collection, which, with the addition of Trump’s dress this week, will bring to 27 the total number of dresses, and more than 160 other first lady clothing items and accessories.